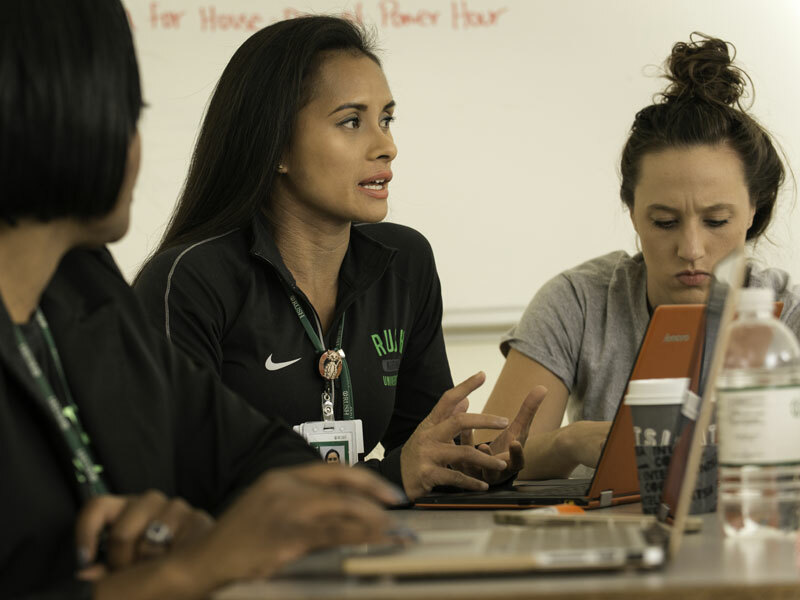 How Rush is using technology and real-world experience to change classrooms. Michelle Sergel, MD, medical director of the Rush Center for Clinical Skills and Simulation (right), walks students through a procedure using a simulation manikin. Since opening in 2014, the simulation center has more than tripled training capacity for students as well as clinical teams. Joy LaCalamita pushes her wheeled walker next to a chair and table and sits down. The 66-year-old from Lake Barrington, Illinois, smiles at the five students who are seated around her in a classroom on the ninth floor of Rush’s Armour Academic Center. These students represent an array of Rush programs: physician assistant, general entry master’s in nursing, biotechnology and Rush Medical College. The five ask LaCalamita questions about her life, ranging from how she gets around her house to her doctor’s appointments and other aspects of her daily life. The students listen intently, smiling at times and nodding at others, as they learn about LaCalamita’s family, dogs and artwork, as well as the challenges she has faced since being diagnosed with multiple sclerosis and breast cancer 12 years ago. It’s far too early in their education for this group of students — all in their first and second years — to offer any diagnosis or advice. Rather, the five are among 370 Rush students who are participating in a seminar to learn what life is really like for volunteers like LaCalamita, known as Health Mentors, who live with chronic conditions. The Health Mentors seminars began in 2015 as a way to bring students from all four Rush colleges together to build their understanding of how specific each patient’s individual experience is, both within and outside a medical institution. The seminar is among several efforts to weave interprofessionalism into Rush’s DNA, from first-year students all the way up to clinical practice and research. We have a faculty so committed across all of our programs in the college that, while still maintaining their full-time responsibilities, they revamped the entire curriculum. experiences. Colleges are finding ways to sustain research efforts even as National Institutes of Health grants become increasingly competitive, and curricula are going through complete overhauls. One of the major changes happening within the University is an effort to convert all four colleges to the same semester-based academic calendar. The College of Health Sciences and the Graduate College have reworked their curricula and schedules to fit the new timeframe. “We have a faculty so committed across all of our programs in the college that, while still maintaining their full-time responsibilities, they revamped the entire curriculum,” said Charlotte B. Royeen, PhD, OTR/L, FAOTA, dean of the College of Health Sciences. The Graduate College took the opportunity to create a new degree program while reworking its curriculum. 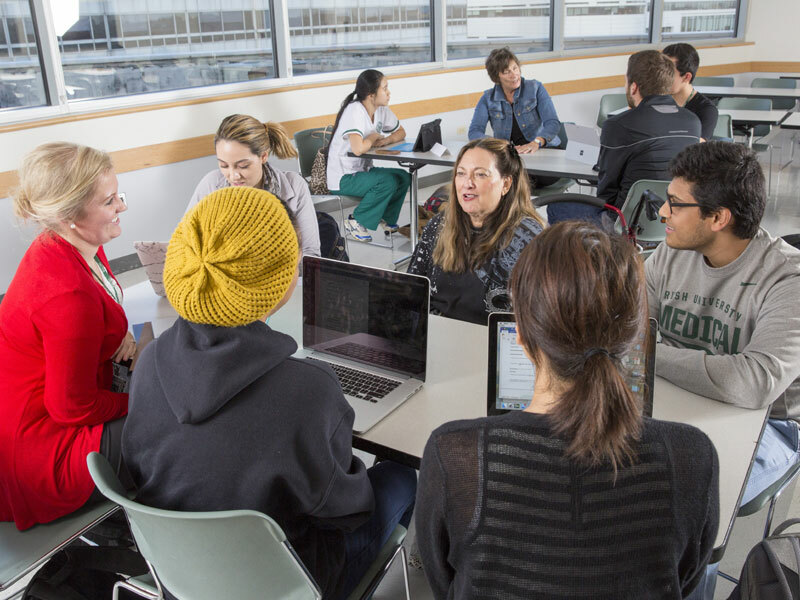 The Integrative Biomedical Sciences Degree track was created to instill in students the resiliency, critical analysis and strategic thinking needed for the quickly evolving field of biomedicine. We’re not going to change health care — or poverty or any larger universal issue — if we don’t change health care education. As Rush University continues to grow and expand, adding resources to simulation will remain a priority in service of students and faculty across all four colleges. 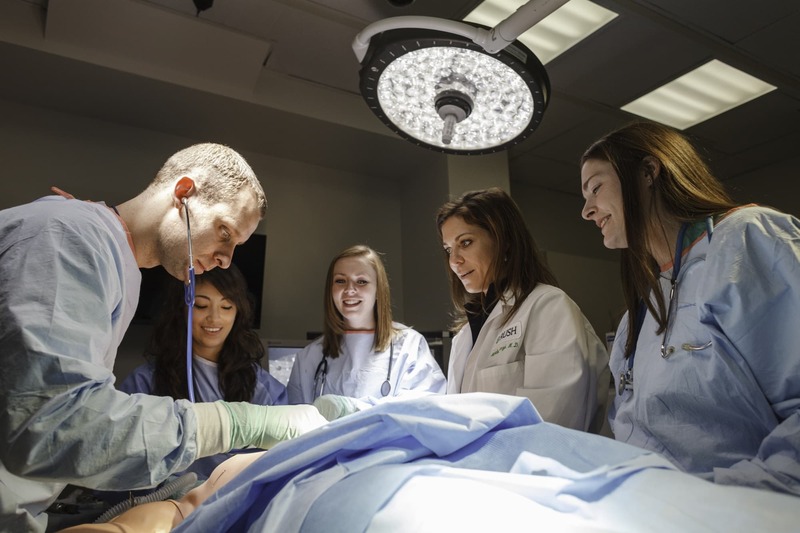 Since opening in fall 2014, the Rush Center for Clinical Skills and Simulation has tripled the amount of simulation training that Rush can accommodate. “Clinical placements can be very competitive, and as we move to having fewer patients in hospitals, we can leverage simulation as an alternative approach that’s highly effective for teaching students through experiences,” said Marquis Foreman, PhD, RN, FAAN, the John L. and Helen Kellogg Dean of Rush University College of Nursing. Online learning is essential for students who need flexibility in their career development, especially postgraduate students, and Rush is a national leader in distance learning. To create even more effective online learning programs, College of Nursing faculty are now attending the Online Learning Consortium series to be certified in teaching online, giving them the refined skill set needed to develop curriculum for and instruct this new kind of student. And as opportunity swells but research funding remains in short supply, finding innovative approaches to fund student research remains a top priority. The Graduate College proposed a way to provide in-house funding for 10 PhD students to pursue dissertation projects with faculty without having to worry about the ever-shrinking pool of available NIH funding to enable their efforts. In the College of Nursing, the Golden Lamp Society — the donor recognition society for those who support the college at the level of $300 or more each year — awards research support to one DNP and two PhD nursing students annually. And each year, the Rush Medical College Alumni Association provides funding that allows 20 medical students, working alongside faculty, to pursue promising research opportunities through the Rush Medical College Summer Research Fellowship program. The top 20 student fellows are honored with the designation of Alumni Association Scholars. 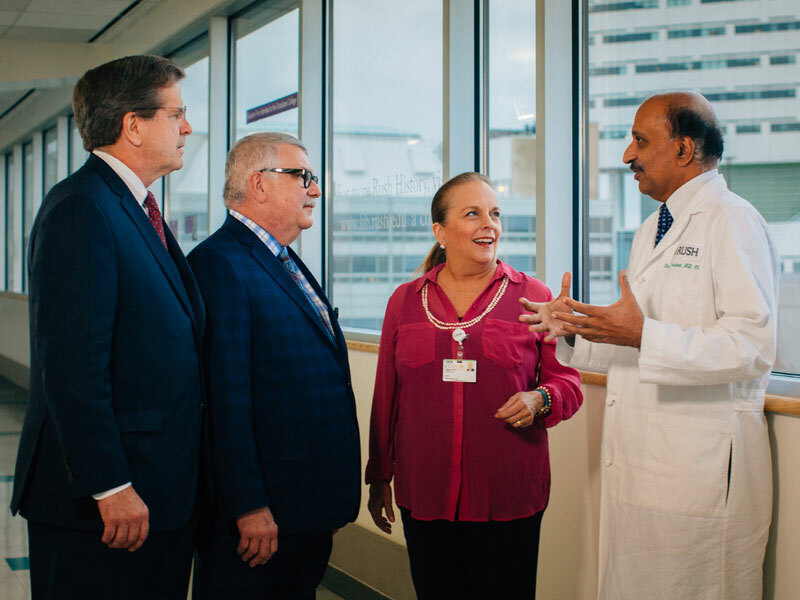 (From left to right) James Mulshine, MD, acting dean of the Graduate College and professor of internal medicine; Marquis Foreman, PhD, RN, FAAN, the John L. and Helen Kellogg Dean of Rush University College of Nursing; Charlotte B. Royeen, PhD, OTR/L, FAOTA, dean of the College of Health Sciences and A. Watson Armour III Presidential Professor; and K. Ranga Rama Krishnan, MB, ChB, Henry P. Russe, MD, Dean of Rush Medical College and senior vice president of Rush University Medical Center, are all developing innovative ways to educate at Rush. In the Health Mentors seminars, volunteers like Joy LaCalamita (center) help students from all four colleges better understand the patient experience. More opportunities for student-led discussion help Rush University students become active learners, equipped to apply information sooner.